Post Apocalyptic Productions proudly presents: Medusa’s Darkwave! Medusa’s Darkwave comes back to dominate the 2nd Friday of the month, as always. Join DJs Sprite, Licious, Eternal & Alpha Omega as they mix up the music & video enjoyment of the evening for your clubbing pleasure! 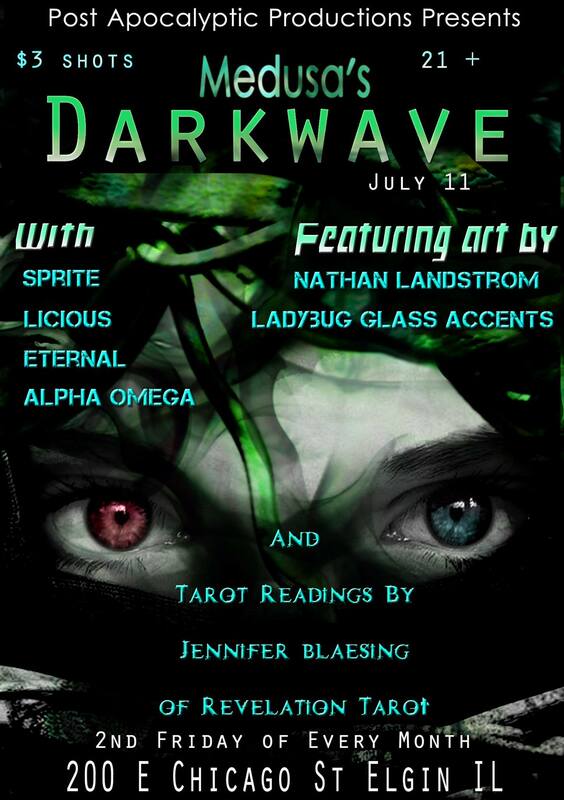 Art will be featured by Nathan Landstrom & Ladybug glass accents along with special guest Tarot readings by Jennifer Blaesing of Revelation Tarot. The Post Apocalyptic Productions street team girls are going to be serving up delicious $3 shots all night! Medusa’s opens at 10:30 and we will be spinning till 4am, free admission before midnight with online RSVP or flier!! Free cover W/flier or RSVP before midnight! ~ by infomorph on July 2, 2014.